Left to right: Haskel’s Ronnie Marshall, Mark Adams and Dave Angus at the new test cell room. 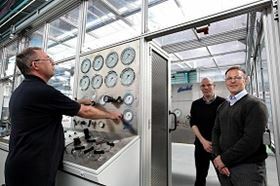 Built with clear Lexan polycarbonate, the room is equipped with an external control console enabling an extensive range of proof and performance high-pressure tests, up to 60 000 PSI, to be carried out and recorded safely and efficiently. It eradicates hazards such as chemical injection type injuries or lacerations from loose hoses; and is backed up by an intelligent control system which can identify leaks and other dangers. “We already have an excellent health and safety record, and this system further mitigates against any of the risks that come with testing from behind a screen or hood rather than in an enclosure,” said Dave Angus, Haskel’s quality, health, safety and environmental manager. “There are many companies around the world that would benefit from this type of chamber, and we would be happy to share our experiences and expertise. It can be built to accommodate testing on a large scale for any piece of engineering that involves pressurised valves or pipelines, such as a car or aerospace equipment." The Haskel products produced in Sunderland are sold into a number of European export markets, including France, Spain, Norway and Denmark.